Riding boots have been a fashion favourite for decades, gaining popularity in the 1980’s and continuing to remain a popular and timeless choice to this day. Comfortable, versatile and most of all warm, they’re the perfect accompanying footwear for any look. It could be that you want to wear a skirt but the weather isn’t giving up and shoes or ballet flats just don’t cut it… so a nice, weatherproof pair of boots is where it’s at. If you want to go all out equestrian chic, a good pair of riding boots with a flattering pair of skinny corduroy jeans and a fitted jacket will give you that classic look. Riding boots haven’t always been a wardrobe staple, though, originally they served a purpose and were designed to protect the legs of horse riders from being pinched by the leather of a saddle and to hold the foot in a stirrup comfortably. From there, a number of notable boot styles were developed, such as hunt boots which have a top cuff, field boots that are partially laced and the unmistakable cowboy boot. Many of these styles were taken on by fashionistas who gave them a more design lead appeal as opposed to a practical one. Traditionally all riding boots were made from smooth leather, usually cowhide and this is still a favourite, with softer, finer quality leather increasing the price of the boots. However, materials such as synthetic leather, vinyl, and canvas have also become quite popular. Design features such as quilting and contrast stitching have also become a regular feature of fashion riding boots, as well as cosmetic embellishments such as buckles and buttons. When we thinking of riding boots in terms of fashion, there are probably quite a few interpretations. Generally you’ll recognise a riding boot because it’s knee high and has a flat or low heel. There are many popular colours, styles and finishes to choose from these days, but all are style driven with comfort coming in a close second. The main colours for riding boots are earthy shades such as black, dark brown and tan, though there are variations of grey, red and navy blue for the more daring amongst us. Some synthetic and leather variations can also have a patent finish and these would usually be worn on more formal occasions. Most fashion riding boots are made to mould the shape of your leg and either pull on or have a zip running down the inside seam for ease. Another style that’s available but tends to be more trend bias is full lace up, though these don’t always suit every taste and can be a little time consuming to get on and off. Many of the styles of today have cosmetic embellishments to enhance the design. As well as the buckles and buttons that were previously mentioned, some will have contrasting zips to the outside of the boot and many also have pull tabs around the cuff, making it easier to pull on the riding boots. Another style favorite is straps, some designs will incorporate strapping around the boot that’s finished with rivets or buckles for a striking new look. Traditional riding boots would only have this feature for practical purposes such as tightening the boot around the ankle or calf for a better fit. Making riding boots isn’t an easy process and can often be quite time-consuming. More expensive riding boots will generally be made by hand with little mechanical input. Like all knee-high boots, riding boots will incorporate a heel (usually a flat or low heel), a toe box, a tongue section and a shaft, often they will have an elasticated gusset around the cuff of the shaft to help with fitting. All of these sections are individual pieces of material. If leather is to be used, all of the sections are sewn together and then stretched around a mould called a last to form the shape of the boot. This can take around 24 hours before the upper of the boot is ready to be fixed to the sole. The sole of a riding boot is made of three parts, the insole, midsole and outer sole. Insole – The more expensive riding boots usually have an insole made from soft brushed leather, cheaper options tend to have cotton or synthetic leather insoles. Midsole – Midsoles can be made from a number of materials, materials such as leather and cork are usually reserved for more expensive boots, with polyurethane and EVA foam the most popular material at the other end of the price spectrum. Outer Sole – The outer sole of riding boots can also vary widely, some of the most common would be the commando sole which is made from solid vulcanised rubber with a deep tread for added traction, these can however been quite weighty and a lighter, smoother rubber sole is often a good alternative option. Another popular outer sole type would be leather which was the original material used to make riding boots, again this is more widely reserved for the higher end products. Cork Nitrile is a good, lightweight alternative to leather soles, it’s a composite of rubber and cork pieces that can be smoothed and thinned without losing durability. The last of the popular outer soles would be crepe rubber which is a natural latex based rubber and is most often used for light coloured soles. It’s recognisable by its milky yellow colour and crinkly texture, crepe rubber is also slightly heavier than normal rubber. Once all of the relevant parts are ready, they’re all attached to one another, higher end boots will usually be stitched or nailed together whereas lower priced boots tend to be glued. This reduces production time and can be done more efficiently by machine as opposed to by hand, helping to keep the cost down. When it comes to fitting and sizing riding boots, it’s a little more complicated than just choosing the size you’d normally go for in shoes. Riding boots are quite structured and should fit your foot, ankle and calf well without any slouching or gaps. The first step would be to measure your feet, following the tips in our women’s shoe size guide should help you establish what size riding boots you’ll need. It’s hugely important to make sure you choose the right size, not only for the health of your feet but for comfort too. A pair of riding boots that are the wrong size and are uncomfortable are likely to be a pair that don’t get worn very much. Once you’ve established what size riding boots you need, the next step would be to make sure the fitting is correct. This is where you establish whether you need wide fit riding boots or narrow fit riding boots. A pair of boots that are too narrow or too wide can cause discomfort so make sure you get the fit right. Using our women’s shoe fitting guide will help you work out the perfect fit for you. An additional measurement that you will need to take into consideration is calf size. It could be that you have wide fitting feet, but that doesn’t necessarily mean you have a wide calf, the same applies to a narrow foot and narrow calf. A calf that is too wide for the boots can mean they become uncomfortable if worn for a prolonged period of time, it can also make movement more difficult. Boots that are too wide around the calves can cause the boots to slouch which will mean they won’t look their best, gaps around the calf can also mean the boots aren’t as insulating as you’d hope during colder weather. With that in mind, using our guide to narrow and wide fit calf boots will definitely help you get the right calf fitting. How you care for your riding boots will all depend on the materials that they’re made from. Leather boots will require a different cleaning method to canvas or suede boots for example. 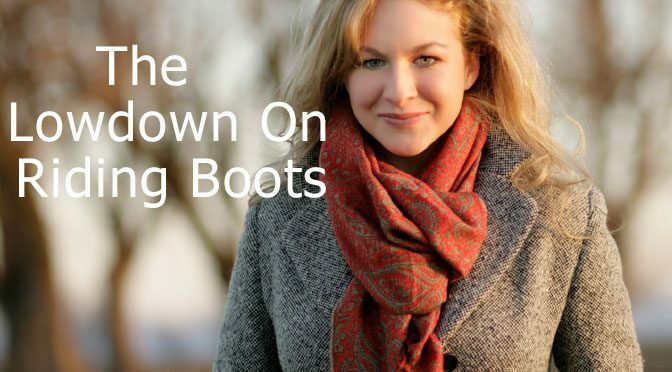 There are a number of techniques that will help you maintain your riding boots, our guide to women’s shoe care and cleaning is a great place to start and will give you lots of ideas on how to look after your boots and get the best out of them. Black is probably the most popular colour for riding boots, this is likely due to the fact it’s the most versatile colour and can be teamed with pretty much anything. But it can also be one of the hardest colours to maintain, knowing how to care for black boots can help maximise their life as well as having them look their best at all times. 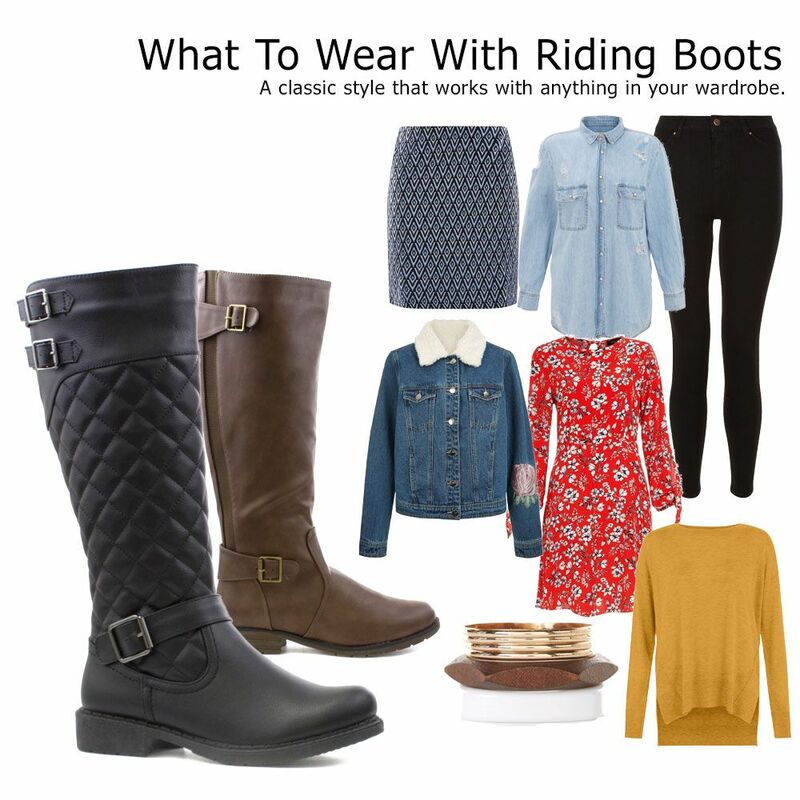 When it comes to wearing riding boots, there’s very little that they won’t go with. When they originally gained popularity in the 1980’s, coupling them with a midi length skirt was all the rage and to some degree, this is still a popular choice. As time went on, however, wearing them over jeans or leggings was the thing to do. Particularly favoured during the winter months, riding boots are durable, warm and effortlessly stylish and make a great alternative when ankle boots or shoes just won’t cut it. They make the perfect footwear when you want an easy going look with a slouchy jumper and leggings, but they can also be dressed up just as easily with tights, a tailored skirt, and blouse. It’s not completely unreasonable for riding boots to be worn in summer either, they make the perfect festival footwear and are a stylish alternative to wellies. Team them with pair of denim shorts, a funky T shirt and a casual shirt over the top and you’ve got a whole new look. The start of 2017 has seen the ever popular riding boot remain a firm favourite with young and old alike. Clean, sleek styles that have an air of vintage are all the rage this season. Burnished tan leathers and smooth black, ark back to early 1900’s militaria styles, with simple yet eye catching detail such as a single buckle around the ankle or a single contrasting button to the cuff. If a style of riding boot with a little more detail is preferred, miniature stud embellishments are very trendy right now, a nice feature when a little bit of bling is more your thing without being over the top. Riding boots are by far one of the best styles to go for when it comes to comfort, design, and warmth. Hugely versatile and available in so many different styles to suit different tastes, we believe that no one should be without a pair! Steve at the Chelmsford branch was fantastic, he went over and above to locate Wellington boots for my grandson. He is an asset to your company. Thank you for your kind comments, we’re so happy to hear that Steve was helpful when you visited our Chelmsford store, we will be sure to pass along your comments and hope to see you in store again soon.